There were eight tiger subspecies at one time, but three became extinct during the 20th century. Over the last 100 years, hunting and forest destruction have reduced tiger populations from hundreds of thousands of animals to perhaps fewer than 2,500. Tigers are hunted as trophies, and also for body parts that are used in traditional Chinese medicine. All five remaining tiger subspecies are endangered, and many protection programs are in place. 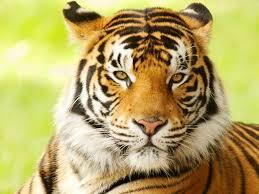 Bengal tigers live in India and are sometimes called Indian tigers. They are the most common tiger and number about half of all wild tigers. Over many centuries they have become an important part of Indian tradition and lore. Tigers live alone and aggressively scent-mark large territories to keep their rivals away. They are powerful nocturnal hunters that travel many miles to find buffalo, deer, wild pigs, and other large mammals. Tigers use their distinctive coats as camouflage (no two have exactly the same stripes). They lie in wait and creep close enough to attack their victims with a quick spring and a fatal pounce. A hungry tiger can eat as much as 60 pounds (27 kilograms) in one night, though they usually eat less. Despite their fearsome reputation, most tigers avoid humans; however, a few do become dangerous maneaters. These animals are often sick and unable to hunt normally, or live in an area where their traditional prey has vanished. Females give birth to litters of two to six cubs, which they raise with little or no help from the male. Cubs cannot hunt until they are 18 months old and remain with their mothers for two to three years, when they disperse to find their own territory. A tiger's roar can be heard as far as 2 mi (3 km) away.